A science fiction military action film, Battle: Los Angeles is overwhelmed by bad battleground CGI and rarely achieves a respectable level of action-driven entertainment. At the Camp Pendleton military base near Los Angeles, Staff Sergeant Michael Nantz (Aaron Eckhart) is about to retire from the Marines, still emotionally scarred by losing some of his men in a recent deployment. His plans are interrupted when hostile aliens stage a massive invasion of Earth, with the heavily armed aggressors arriving on meteor-like vessels and landing off the coast of dozens of cities around the world. Nantz is pressed back into service as part of a platoon under the command of Lieutenant Martinez (Ramon Rodriguez), tasked with saving civilians trapped at a Santa Monica police station. The civilians include veterinarian Michele (Bridget Moynahan) and local man Joe (Michael Peña), who is with his young son. However, the aliens prove much more powerful than initially thought. Nantz and Martinez are joined by air force Technical Sergeant Santos (Michelle Rodriguez) and together they have to find a way to save the civilians and uncover a weakness in their enemy. 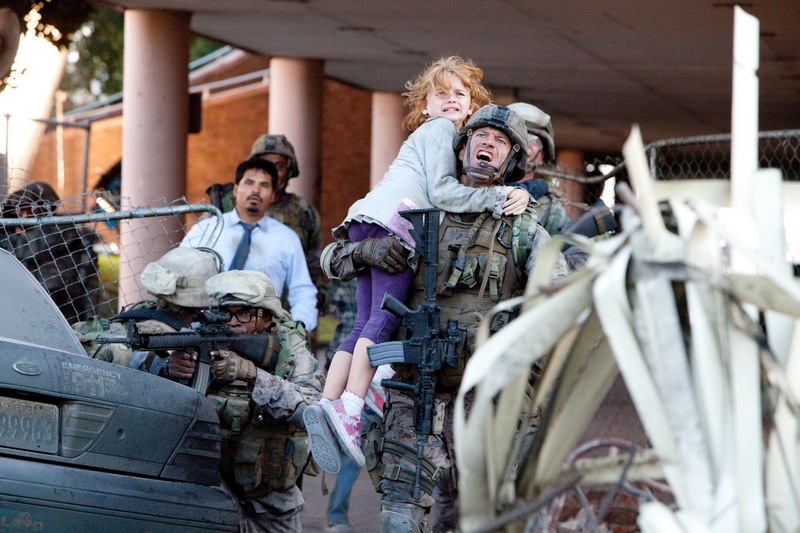 Directed by Jonathan Liebesman, Battle: Los Angeles is a noisy, often frantic affair. While the premise is about a global invasion and humans fighting for the very survival of the species, the film zooms in to the squadron level, and focuses on a few men engaged in running street battles through mostly destroyed Los Angeles area neighbourhoods. 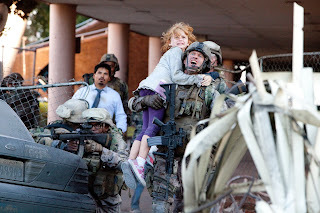 Battle: Los Angeles most resembles the much better Black Hawk Down, with the Somalis replaced by aliens. And just as Black Hawk Down had limited interest in defining who the enemy was, Battle: Los Angeles doubles down on the concept of the enemy as just an abstract thing to be destroyed. Here the aliens are blurry CGI creations, mostly seen from a distance. The lack of any narrative content explaining the other side of the conflict frequently reduces the film to the level of a dumb first person shooter video game. Liebesman demonstrates no control over battlefield visuals, often overwhelming the screen with CGI-created projectiles flying in all directions, giving the impression that a bunch of pimple-faced excitable teenagers were given the task of adding noise and fury to the screen and kept on adding more because more must be better. The jerky camera work does not help. Similarly, the attempts to humanize the squad members all fail. The Marines surrounding Nantz remain interchangeable grunts drawn from the basic repertoire of World War Two movies from the 1940s. 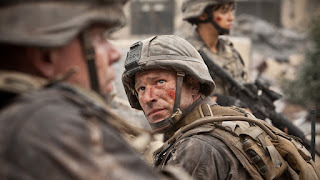 The film is not a total loss: as the action moves into the final 30 minutes acts of heroism, comradeship and sacrifice finally begin to cut through the clutter, and Battle: Los Angeles picks up some emotional steam, helped by a committed and fully square-jawed Aaron Eckhart performance. His grim determination may be enough to save the planet, but not quite the movie.